Dacorum Folk Fest has treated the local community to some of the best folk, roots and acoustic music for three years and predicted BBC Radio 2 Folk Awards Best Duo winners for two years running. In its fourth year, the festival has secured a reigning BBC Radio 2 Folk Award winner, an exciting new folk supergroup with local roots and a sensational guest duo from the USA. 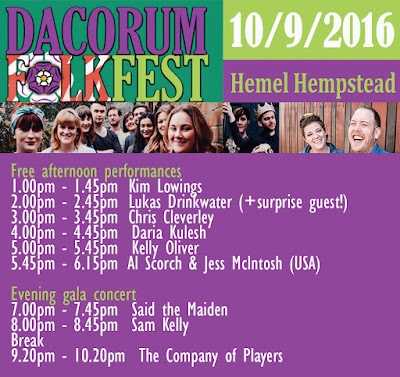 Held in Hemel Hempstead since 2013, Dacorum Folk Fest has featured two fantastic duos as headliners: Phillip Henry and Hannah Martin in 2013, Josienne Clarke and Ben Walker in 2014. Both went on to win the most coveted prize in folk the following year, for the first time in their careers. In 2015, festival favourites, a spectacular 8-piece band Merry Hell were chosen as headliners and completely vowed the audience. A line-up of the best local acts played during the afternoon and evening, many of them winning awards and prizes within the following year. After three very successful years, Dacorum Folk Fest is becoming a firm fixture in the local music calendar. An exciting partnership with Boxmoor Folk and Roots means that the festival is back in 2016, bigger and better than ever before. The festival will return to Hemel Hempstead on Saturday 10th September 2016. This year, for the first time in the festival’s history, one of the acts is a current BBC Radio 2 Folk Award winner. 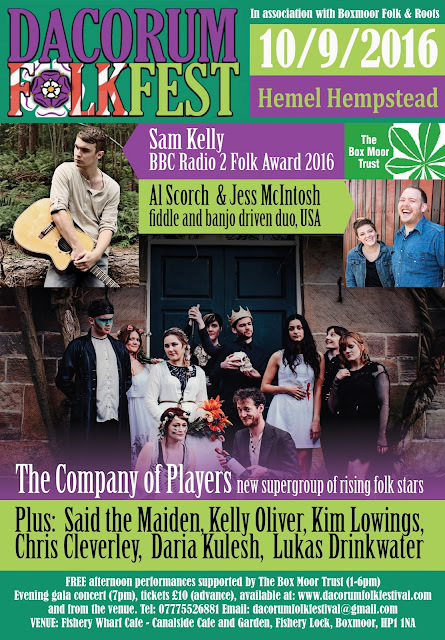 Sam Kelly, also known as a finalist of Britain’s Got Talent in 2012, is one of folk’s brightest rising stars. He transcends the boundaries of traditional and popular music. Sam’s local connection to the Hemel area is through the brand new 10-piece supergroup The Company of Players who will headline the festival this year. It’s the brainchild of Jess Distill, part of award-winning St Albans folk trio Said the Maiden. Celebrating 400 years since the death of William Shakespeare, the group have written a very diverse set of songs with an intrepid and gloriously fun twist on the Bard’s classics, including an Icelandic interpretation of Hamlet put to a hoedown tune, a Russian murder ballad of Siberian Lady Macbeth and Shakespeare’s own heartfelt plea for refugees. The songs were contributed by local artists Minnie Birch (Hemel Hempstead), Daria Kulesh (Kings Langley), Said the Maiden (St Albans) and Kelly Oliver (Stevenage). Other group members are Sam Kelly (Cornwall), Lukas Drinkwater (Devon) as well as Kim Lowings and Chris Cleverley, both from the Midlands. The festival will also feature individual performances by The Company of Players’ members. And if that wasn’t enough, the festival will feature its first ever international act. Al Scorch from the USA, described as “an entertainer, road warrior, storyteller, and one helluva musician”, will be accompanied by the versatile and energetic fiddle player Jess McIntosh. Together, the pair will transport you. The main aim of the festival is to attract the widest possible audience by featuring exciting young musicians on the roots, Americana and indie folk spectrum who don’t limit their creativity to traditional folk, exploring new frontiers and enrapturing audiences in the UK and beyond. The event will be held at Hemel Hempstead’s new canal side venue, Fishery Wharf Café which opened in July. Thanks to the support of The Box Moor Trust, the afternoon performances will be free, followed by an affordably priced evening gala concert. It will be an exciting and inclusive event to bring the whole community together. This year we are very pleased to offer our afternoon concerts free of charge to audiences and their families thanks to a grant from The Box Moor Trust. We will be hosting free afternoon performances by six acts from 1.00pm to 6.15pm. With an evening gala concert comprising three performances from 7.00pm to 10.30pm, tickets are available directly from the Fishery Wharf Cafe and via the following ticket links.